We had a few minutes of hands-on time with the special edition R2-D2 Droid 2 today and dug into one of the main rumors that was floating around about the phone’s processor. Is it clocked at 1.2GHz like the Droid 2 Global? The answer is no. The R2-D2 is at the same 1.0GHz that the original Droid 2 is at, but we have a feeling this will change in a later update. After all, these phones all have the same exact processor, the D2 Global is just clocked higher. Oh well right? And back to the phone! 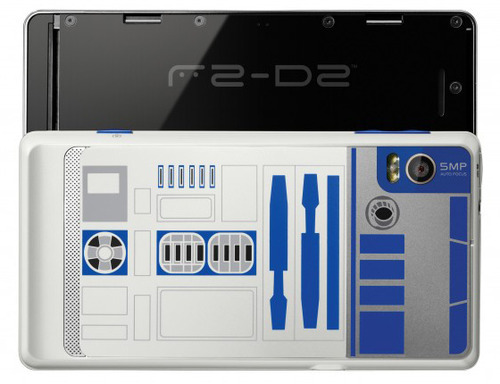 It’s exactly as you have already heard (and seen), a Droid 2 that has been themed to look like an R2-D2 unit. I will say, that they’ve done a great job with the outside of the device and all of the special features tucked into the OS. For the first special edition Droid, Moto and Verizon have come up with a winner. This is definitely a collector’s item for all of the Star Wars gurus out there. The phone launches tonight at midnight online and in select stores for $249 on contract after $100 mail-in-rebate. Full retail price is rumored to be $599. If you purchase one, you’ll find a couple of extra goodies in the box including the special edition multimedia dock and a set of Motorola headphones. There is your extra $50 people. Stop complaining about the price!